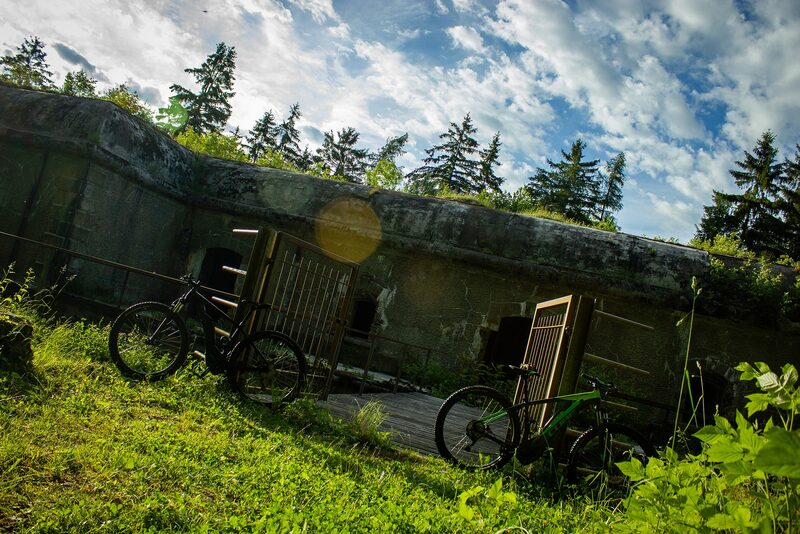 With E-BIKE Bettini you can rent pedal assisted mountain bikes and enjoy the beautiful Valtellina. How far do I go with a full charge? The battery life of a mountain e-bike depends on many factors. Our batteries are lithium-ion batteries, so they last longer than lead-acid batteries. The duration depends on the type of terrain, the weight of the pilot and the level of assistance that you set. Is not it dangerous to go with an e-bike? I'm afraid of speed. There is no danger: they are mountain bikes with pedal assistance thanks to an electric motor. You choose to speed go: the one that allow your legs! If you do not pedal, you'll stay still. What happens if I run out of juice? Our e-bikes have a Bosch Performance engine that allows you to ride freely even without the aid of a battery. It will be a bit more tiring, but you'll make it! I do not know the routes, what can I do? Do not worry, on our site there are various suggested routes. We also recommend that you download the Valtellina Outdoor application on your smartphone where you can find various itineraries suited to your skill level. Departing from Bormio (1225 m a.s.l.) you will face a 13 km transfer of steady climbing along the river Frodolfo, up to Santa Caterina Valfurva - birthplace of the alpine-ski Olympic champion Deborah Compagnoni and of the mountain climber Achille Compagnoni, hero on the K2. Here the real ascent begins. 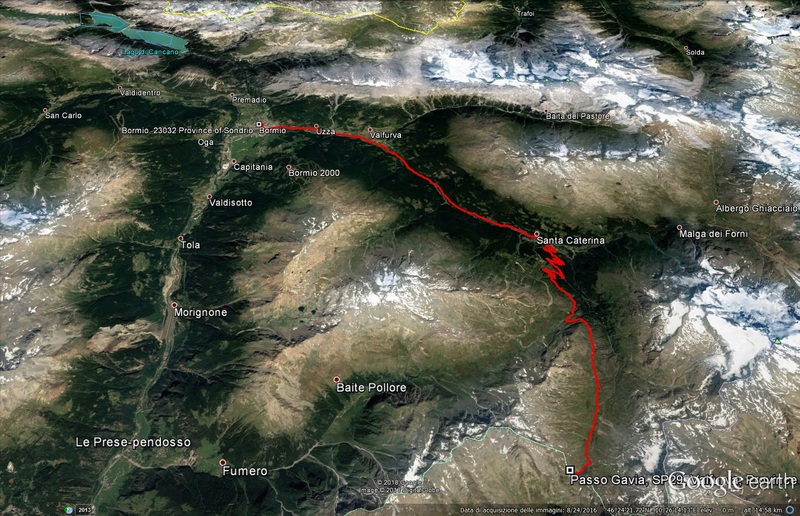 From Bormio to the Gavia Pass (2652 m a.s.l.) you will ride over 25.6 km with an average gradient of 5.5% and a maximum of 15%. After a few kilometres, you will see cattle left out to pasture among the fields of Plaghera. The scenery changes completely entering Gavia Valley. You will reach the top through a narrow road without hairpins. The further you go up, the more barren the surrounding landscape becomes. After the Rezzalasco stream, there is the most demanding part, 5 km to the end of the hillside. 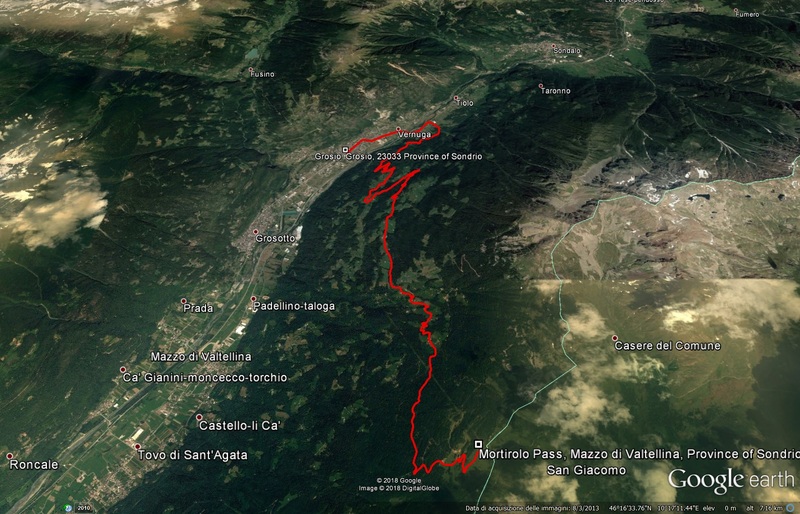 Soon after, the climb eases, passing by Rifugio Berni, the little lakes and finally Rifugio Bonetta. In 2013, on top of Gavia the busts of Fausto Coppi and Vincenzo Torriani were installed in their memory. On this climb a legendary leg of the 1988 Giro d’Italia took place, when the Dutch Johan Van Der Velde, in first position, had to take shelter in a campervan because of frostbites. Snow also beat the riders during the 2014 Giro, won by the Colombian Nairo Quintana. We are now talking about the least demanding of the climbs to reach the legendary pass of Mortirolo. 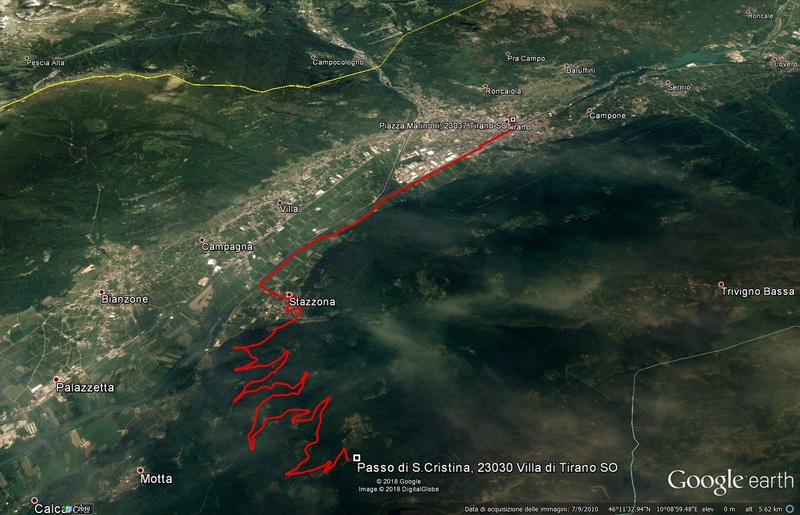 Starting off in Grosio, at 630 m a.s.l., you climb for about 14.8 km with an elevation gain of 1222 m. The average gradient is 8.3% and the maximum is 14%. This side has hardly ever been included in the Giro d’Italia, except in 2012, when it was ridden downhill, with the winning attack of the Belgian Thomas De Gendt. Many tourists, coming from Bormio, choose this side to climb up to the pass, preferring it to the classic ascent - from Mazzo in Valtellina- because it is easier. However, the climb is spectacular and after the first 3 km quite demanding and immersed in evergreens; after that section, a breathtaking view opens on Valtellina. Along the climb, between kilometre 10 and 11, close to an agriturismo, the gradient increases until the top. After this rise, there are some hairpins that give you a break before reaching, after a little church, the side of the classic Mortirolo, at the Biorca crossroad. 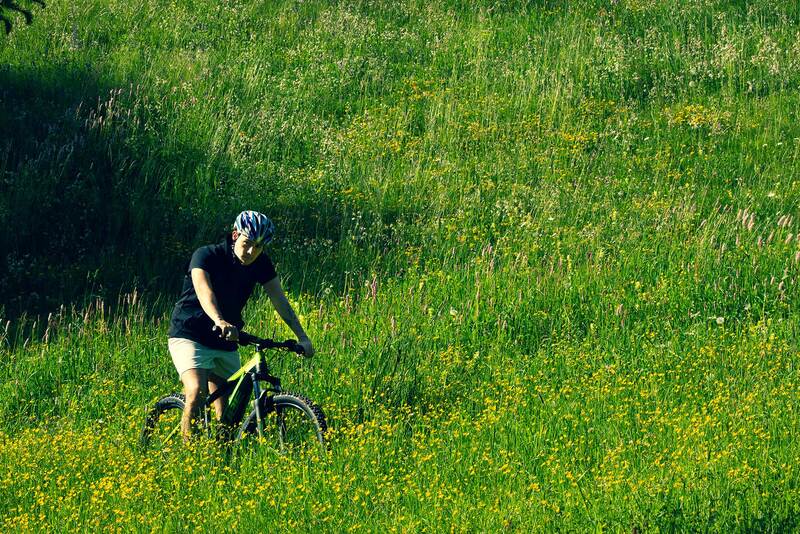 The pass of Santa Cristina is a pleasant discovery for bike lovers who want to cycle on less busy roads. This climb starts at km 7 of the SS.39 at about 780 m a.s.l. 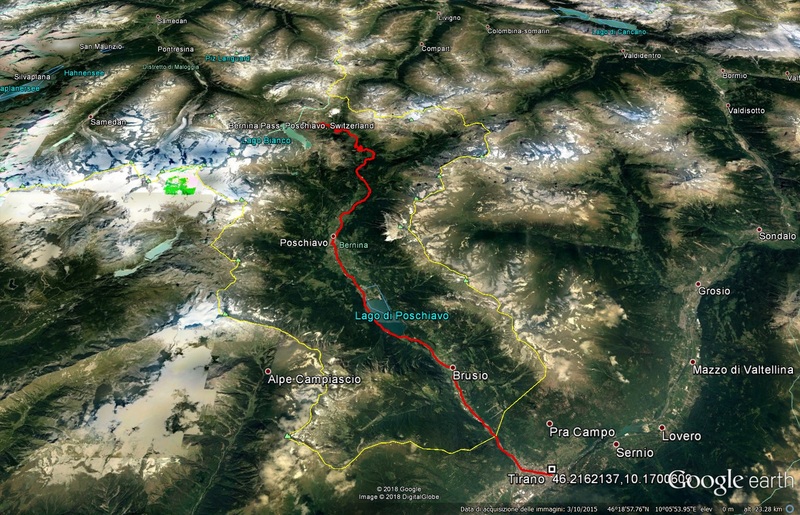 and reaches the pass, at 1427 m a.s.l., with an average gradient of 8.2% and a maximum of 14%. This ascent was revealed to the cycling community during the 1994 Giro d’Italia, when Marco Pantani outdistanced Indurain and arrived all alone to Aprica. You will reach this ski resort after a total climb of almost 12.5 km, either from Tresenda or Stazzona, turning left into the mountain road to Santa Cristina. After about 1 km, the ascent becomes demanding and the gradient remain steep until a place called Mezzamonte, where a group of huts offer a good landmark after so many roads criss-crossing the dense wood. There are several long straight sections where it is impossible to release the big effort. 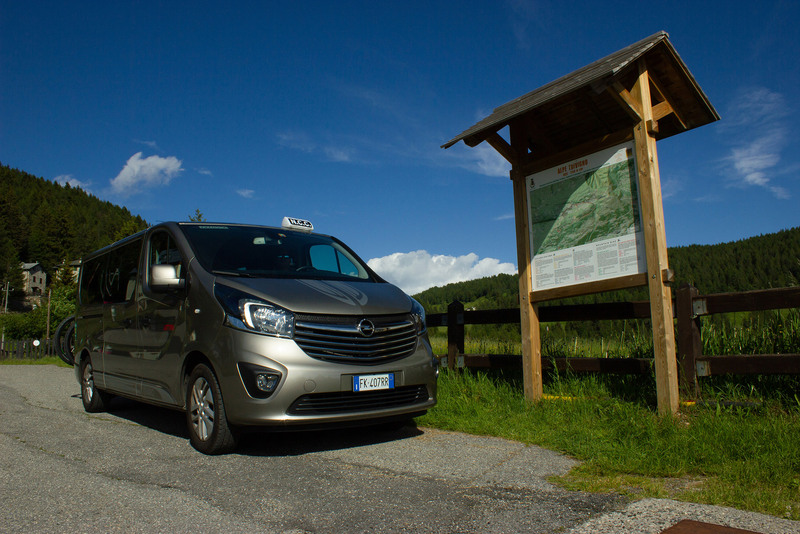 Once you have finally reached the pass, the road becomes gentle and at the crossroad you can choose if you prefer to go on towards Trivigno, suffering again for a while, or to go down to the nearby town of Aprica. The ascent leading to the pass of Aprica is technically quite easy and you can tackle it after having climbed the Teglio one, if you want to do a more demanding tour. The Giro d’Italia has faced it several times but it never turned out to be crucial. The road is broad with wide turns. You go up for about 12 km with an average gradient slightly above 6%. Kilometres are marked by road signs clearly showing the distance to the pass. The road is very busy, especially at weekends, and it is advisable to be careful. For well trained cyclists during the climb there are some detours to access more demanding roads, such as those towards Santa Cristina and San Rocco. An endless ascent in the “most Italian” among the Swiss valleys. Departing from Tirano at 450 m a.s.l. you immediately enter the Poschiavo Valley, with a climb which runs parallel to the famous Bernina Red Train, Unesco World Heritage. You are going to cross the border with Switzerland so it is advisable to take your passport with you. Data and statistics say that you will have to ride for 33.4 km, fortunately with flat sections especially close to Miralago, after 8 km of constant ascent. 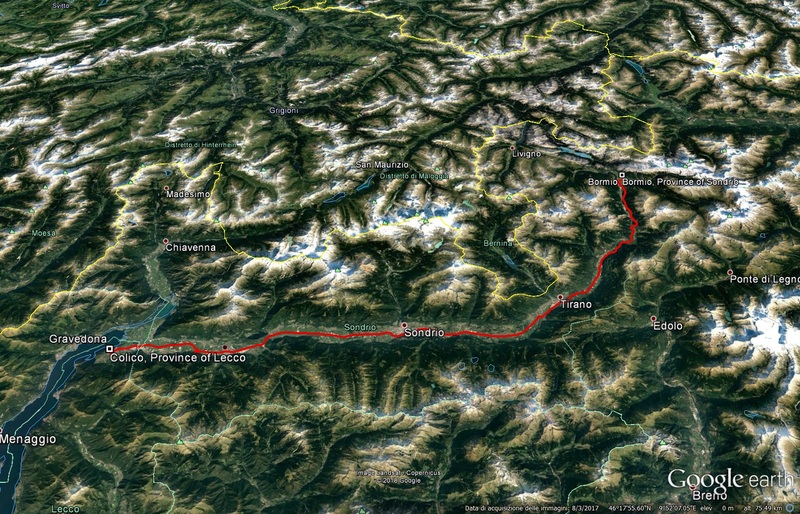 The most difficult part arrives after Poschiavo, more precisely after the little village of S. Carlo. 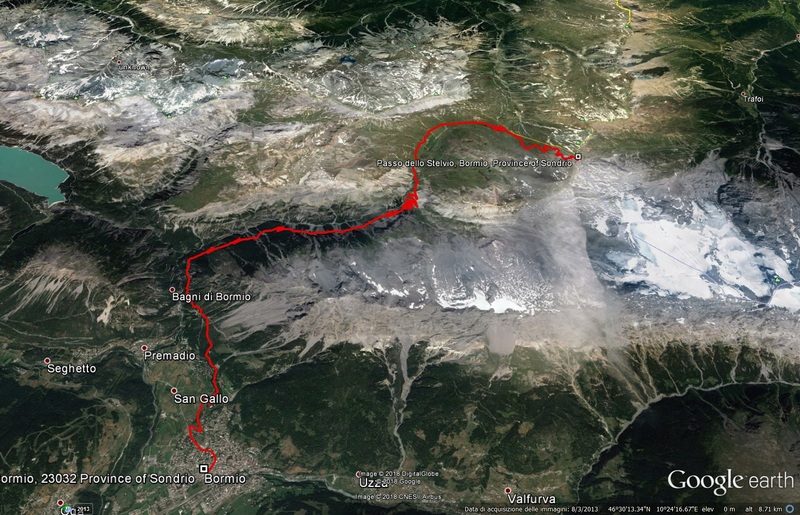 At this point the aim is to reach the pass at 2330 m a.s.l. The maximum gradient is 12%. The long straight roads can be very challenging and that’s why it is good to know that the first landmark is at km 28 where the road becomes flat and there is a restaurant. A last effort and you will reach the crossroad to Livigno, easily recognizable by the Customs building. 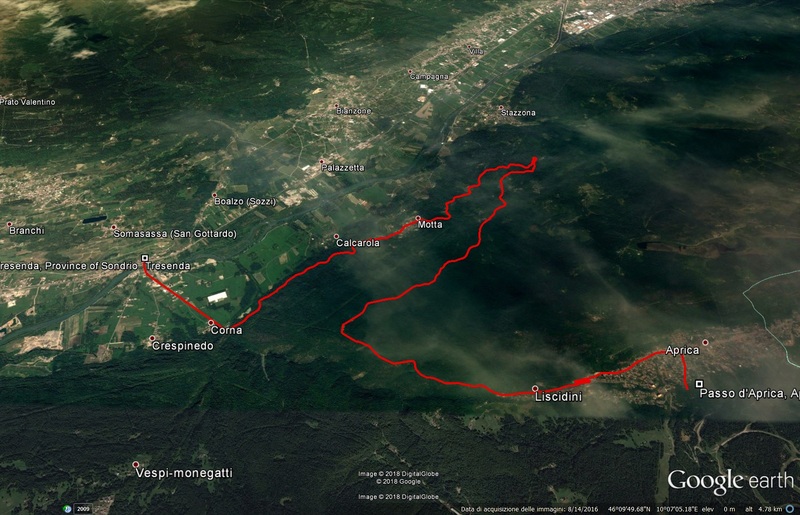 Only 3 km more and you will arrive at a little lake with a mountain hut. Cycling or walking along the banks of the river Adda to visit historical hamlets with castles, churches and palazzi or to taste the square but simple meals of our traditional cuisine. 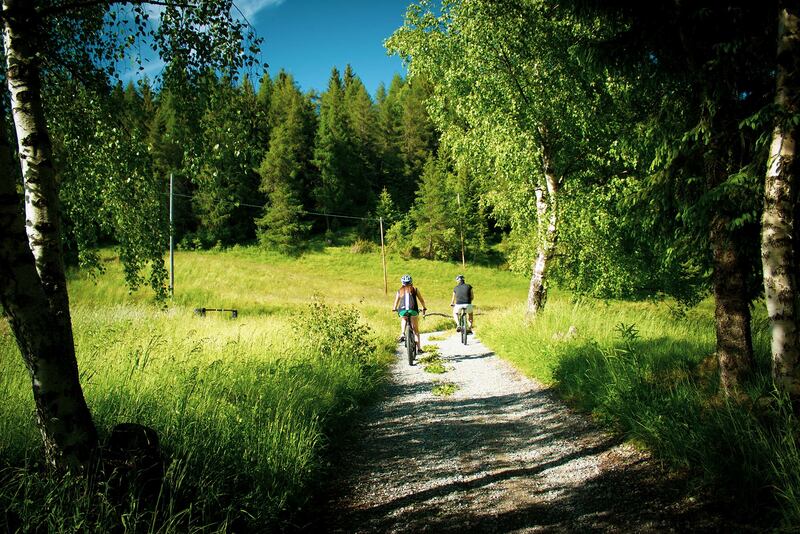 The cycling and walking route, mostly flat or with slight slopes, is suitable for anybody, also for families with kids. It is also possible to choose to explore a short part of it, stopping for a picnic in one of the several parking areas. The variety of partial views and panoramas will make these walks really spellbinding. The railway runs parallel for most part of the route. It is therefore possible to arrive and depart by train, also bringing with you our e-bikes. For any request we are always ready to meet your needs. Just ask us!